DENTAL IMPLANTS are artificial object that simulates a tooth root and is placed surgically in to the jaw bone and serves as an anchor or foundation for fixed or removable replacement teeth. Losing one or more teeth in the mouth leads to an inability to chew properly and a gap in your smile and also leads to bone loss. Replacing missing teeth with dental implants restores that confidence in your smile and ability to chew and enjoy any food you like. The best part is you can achieve this without compromising adjacent healthy teeth. 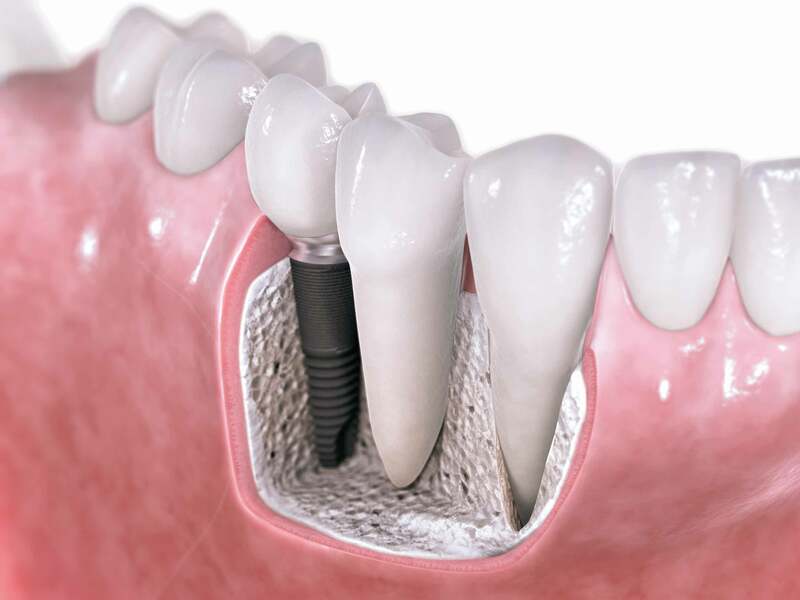 Dental implants are the next best option to natural teeth. Q) Are Dental Implants safe and how long will they last? A) Dental Implants are a safe, well-established, tried-and-tested treatment. It’s probably true to say that dental implants, much like natural teeth, will last for as long as you care for them. How well you look after your dental implants – and whether you go for your regular maintenance appointments – will have the biggest impact on how long they will last. If you don’t look after your dental implants they will develop a coating similar to that found on neglected natural teeth. Left untreated, this can lead to gum infection, bleeding, soreness and general discomfort. You could get all these problems with natural teeth. If your dental implants are well looked after, and if the bone they are fitted to is strong and healthy, you can expect them to last for many years. However, just as with other surgical implants (such as a hip replacement) there is no lifetime guarantee. Q) I have missing teeth. Can dental implants always be used to replace missing teeth? A) It depends on the condition of the bone in your jaw. Few special tests need to be done to find out the amount of bone still there. If there is not enough, or if it isn’t healthy enough, it may not be possible to place dental implants without grafting bone into the area first. If the bone quality is good, it is the best option to replace the missing tooth with a dental implant. Q) Why should I get a dental implant rather than just dentures or a dental bridge? A) Dental implants are stronger and more durable than dentures or a dental bridge. They offer a permanent solution to tooth loss. In the case of multiple missing teeth, dental implants may be used to support a dental bridge or with dentures to increase stability and reduce gum irritation. Dental implants, whether used in combination with dentures or a dental bridge or on their own, make it easier to eat the foods you love, speak clearly, and smile with confidence. Q) What happens if I don’t replace a missing tooth/missing teeth? A) When you don’t replace a missing tooth, it can result in damage to adjacent teeth by causing gum recession and bone loss around those teeth. It can cause your other teeth to wear prematurely. You may experience difficulty eating and speaking, shifting teeth, jaw aches, and headaches. Also, when you lose a tooth and its accompanying root, you can experience bone loss in your jaw. A dental implant gives the bone purpose, providing it with something to hold onto. If a great deal of time has passed since the tooth came out and too much bone in the jaw has been lost, grafting may be necessary to increase bone mass before an dental implant procedure can be done. Q) What is involved in dental implants procedure? A) Dental Implants Procedure will entail the following – First the oral surgeon will prepare your jaw for dental implants. This involves creating a small-diameter hole in the jaw bone to guide the titanium screw that holds the dental implants in place. After the initial hole has been created, your oral surgeon will slowly widen the hole to allow for placement of the dental implant screw. Following this placement, often a protective cover screw is placed on top to allow the dental implant site to heal and the dental implant to anchor. This dental implants procedure is called osseointegration. Sometimes, a temporary abutment is placed on the dental implants at the time the dental implant is placed, and a temporary crown is placed on the dental implant. Q) Do the dental implants show? 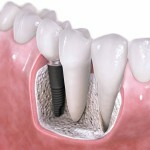 Q) What is the success rate for dental implant surgery? A) Overall, the success rate for healthy patients who receive dental implants is high—from 92–98%. However, patients who are over age 72, who smoke, or who have a history of diabetes or head and neck radiation, or who are postmenopausal and on hormone replacement therapy, may carry a higher risk of dental implant failure as compared with healthy patients. During initial consultation, oral surgeons review the medical history of patients. 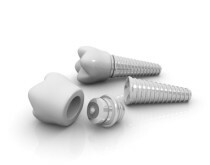 This will allow them to determine whether dental implants are right for you. Q) How much dental implants cost in Delhi? A) As no two patients or their customized dental implant treatments are exactly alike, so the number of appointments, procedures and cost varies accordingly. After an initial appointment and assessment, your dental implant expert should provide you with a treatment plan including the estimated number of appointments and cost, and then notify you if there are any changes during the process. For affordable dental implants in Delhi at low cost, visit the best dentist in Delhi by booking an appointment right away.